Kubernetes includes a web dashboard that can be used for basic management operations. This dashboard lets you view basic health status and metrics for your applications, create and deploy services, and edit existing applications. 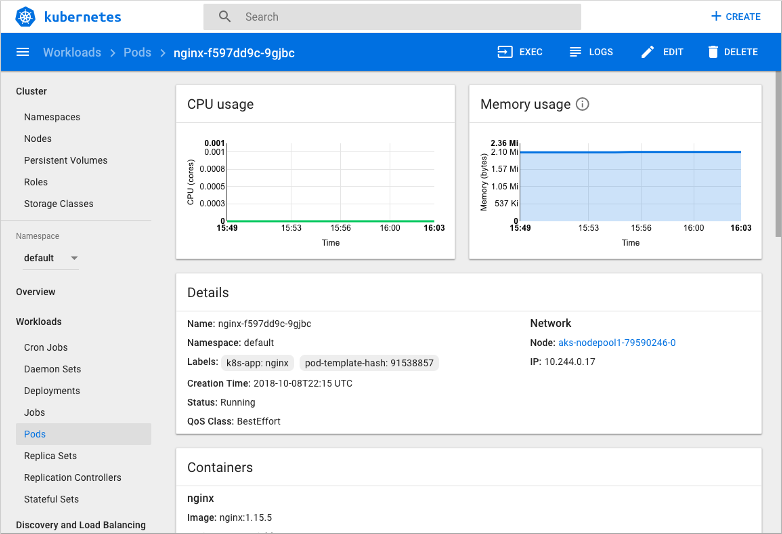 This article shows you how to access the Kubernetes dashboard using the Azure CLI, then guides you through some basic dashboard operations. For more information on the Kubernetes dashboard, see Kubernetes Web UI Dashboard. The steps detailed in this document assume that you have created an AKS cluster and have established a kubectl connection with the cluster. If you need to create an AKS cluster, see the AKS quickstart. You also need the Azure CLI version 2.0.46 or later installed and configured. Run az --version to find the version. If you need to install or upgrade, see Install Azure CLI. 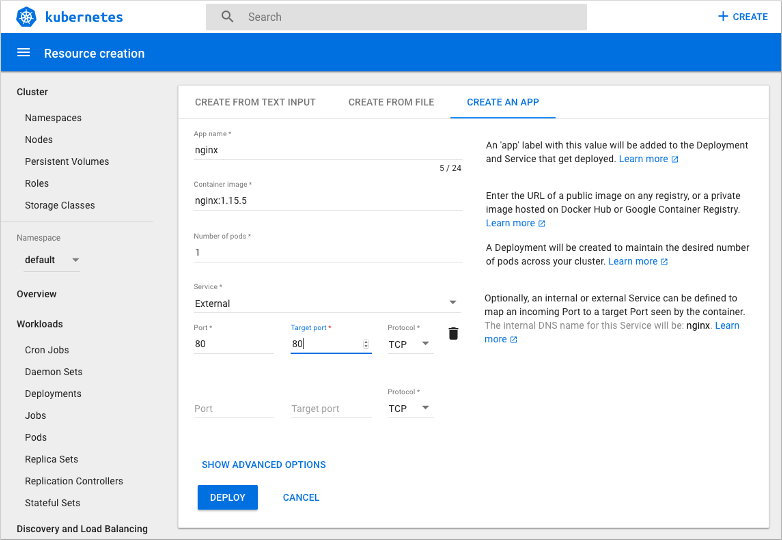 This command creates a proxy between your development system and the Kubernetes API, and opens a web browser to the Kubernetes dashboard. If a web browser doesn't open to the Kubernetes dashboard, copy and paste the URL address noted in the Azure CLI, typically http://127.0.0.1:8001. If your AKS cluster uses RBAC, a ClusterRoleBinding must be created before you can correctly access the dashboard. By default, the Kubernetes dashboard is deployed with minimal read access and displays RBAC access errors. The Kubernetes dashboard does not currently support user-provided credentials to determine the level of access, rather it uses the roles granted to the service account. A cluster administrator can choose to grant additional access to the kubernetes-dashboard service account, however this can be a vector for privilege escalation. You can also integrate Azure Active Directory authentication to provide a more granular level of access. To create a binding, use the kubectl create clusterrolebinding command as shown in the following example. This sample binding does not apply any additional authentication components and may lead to insecure use. The Kubernetes dashboard is open to anyone with access to the URL. Do not expose the Kubernetes dashboard publicly. For more information on using the different authentication methods, see the Kubernetes dashboard wiki on access controls. 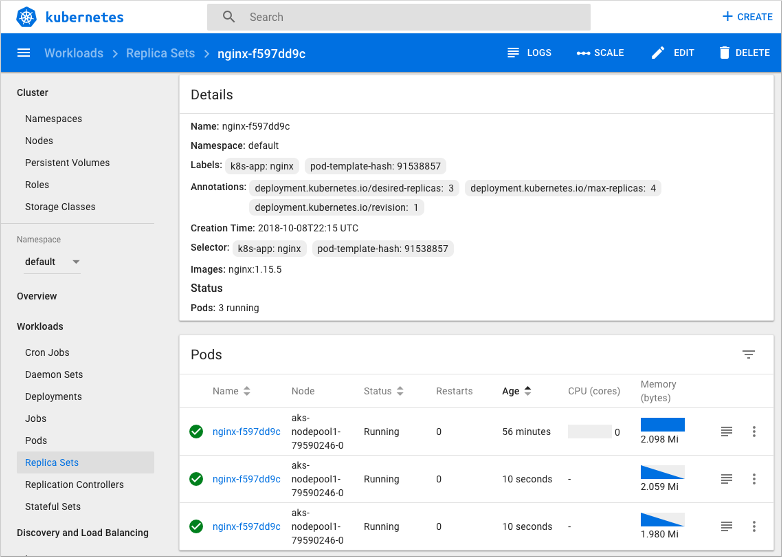 You can now access the Kubernetes dashboard in your RBAC-enabled cluster. To start the Kubernetes dashboard, use the az aks browse command as detailed in the previous step. To see how the Kubernetes dashboard can reduce the complexity of management tasks, let's create an application. You can create an application from the Kubernetes dashboard by providing text input, a YAML file, or through a graphical wizard. Select the Create button in the upper right window. To use the graphical wizard, choose to Create an app. To expose port 80 for web traffic, you create a Kubernetes service. Under Service, select External, then enter 80 for both the port and target port. When ready, select Deploy to create the app. The Kubernetes dashboard can provide basic monitoring metrics and troubleshooting information such as logs. 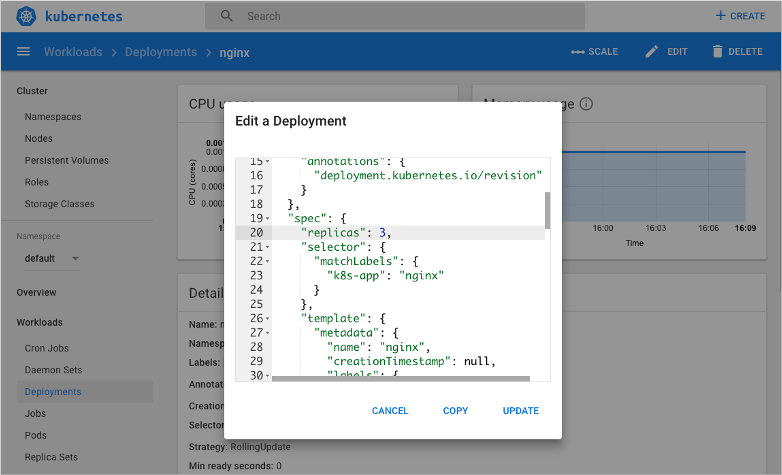 In addition to creating and viewing applications, the Kubernetes dashboard can be used to edit and update application deployments. To provide additional redundancy for the application, let's increase the number of NGINX replicas. Select Deployments in the left-hand menu, and then choose your nginx deployment. Select Edit in the upper right-hand navigation bar. Locate the spec.replica value, at around line 20. To increase the number of replicas for the application, change this value from 1 to 3. 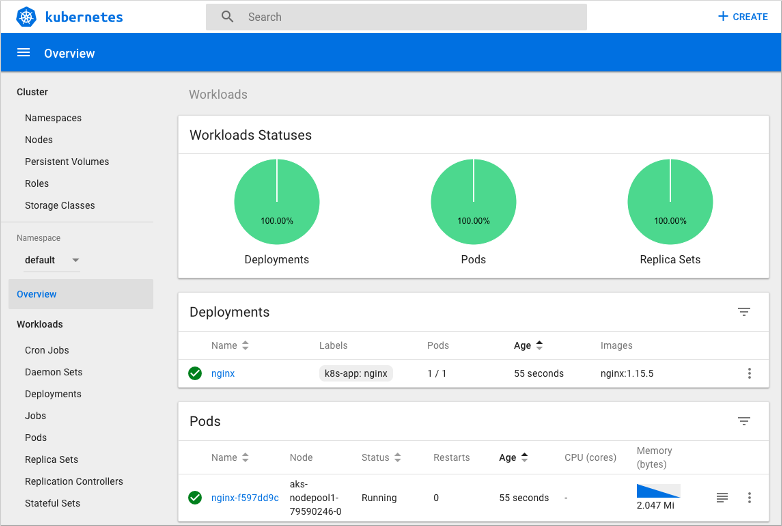 For more information about the Kubernetes dashboard, see the Kubernetes Web UI Dashboard.